Spring and summer are roasting the IRL river again, & may see diamondback terrapin hatchlings along the Indian River Lagoon. You can help the zoo conservation team monitor and track this unique species and its success in the wild by becoming a citizen scientist. 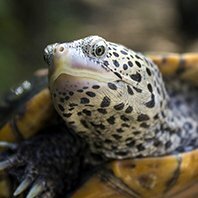 All you have to do is report sightings of any diamondback terrapin you see using the Brevard Zoo reporting form. I have reported seeing three so far. And then one in the shallows of the Banana River while I was wade fishing. 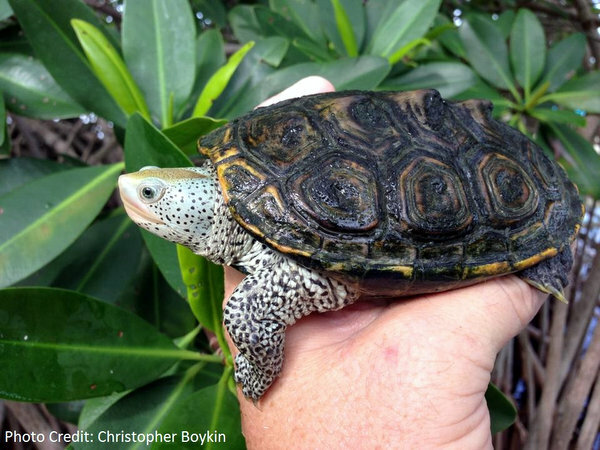 I may be little odd.....however I was so excited a few years back when seeing my first diamondback terrapin--I did not even know they existed....and there was a spotted, white-ish turtle (well terrapin) in the brackish water of the Banana River. Looked like it was half snapping turtle-half??. Could not wait to tell someone-however no one that I knew was interested in "another water turtle"
I was pretty excited to see one in Turkey Creek-several miles upstream in the fresh water.